Keen to make the most of what could be the last rays of warm sunshine of 2012, from 4th-8th September, an adventurous band of FROGs descended onto the foreshore at Rotherhithe to complete the final days of TDP fieldwork this season. We were surprised to see the extent of the erosion since the last recording visit (you can see a short film about the 2011 fieldwork here); a number of large timbers have been exposed at the western end of the site, with some already in danger of being washed away. There was certainly plenty of work to be done. This site is a firm favourite for many of the FROGs, with the narrow cobbled streets, riverfront buildings, public houses and local feats of industrial engineering evoking the prosperity that the area enjoyed from the 17th to 19th centuries. 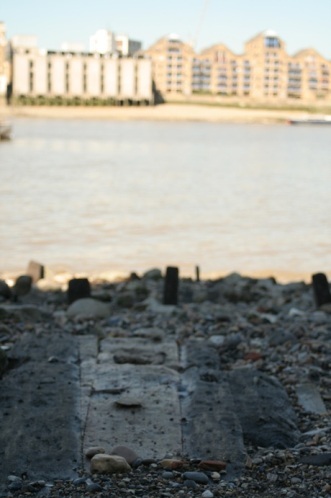 Activities associated with Rotherhithe’s maritime history have left their mark on the foreshore, and various patches and layers of consolidation and rubble, including bricks and tiles from buildings bombed during WWII, and debris from variety of on-site activities (for example, butchered animal bones, coal, nail scatters, and metal-working waste), make prime hunting ground for mudlarkers searching for the tantalising small finds that the river uncovers, (while we were on site, numerous copper alloy pins and fastenings, lead tokens, pipe stems and bowls, coins and buttons were found). 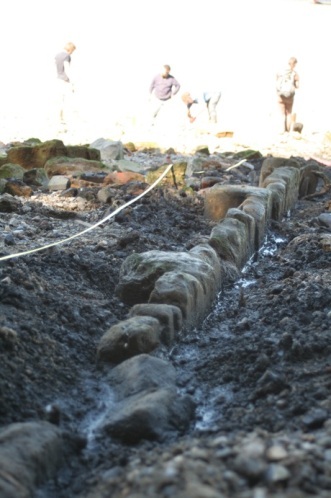 Our role though, was to investigate the various structural remnants that continue to emerge from the foreshore. The timbers that we were recording were situated just to the east of the famous Mayflower. 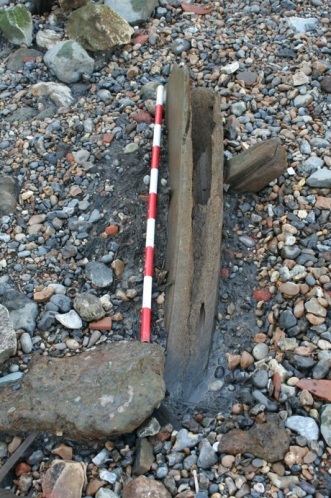 Like the slipway recorded in 2010 and 2011, the new structure/structures clearly incorporated reused ships’ timbers, but the function that they served was less evident. There were at least two windlasses, (right) identifiable by their regular square fittings running laterally, used to hoist the sail, and in reuse, often serving to secure/tie/moor boats. There was also a rudder, (below) from a Thames Barge-sized vessel with a composite structure. A softer/spongier-looking orange timber (fir of some kind) made up a central strip, which was flanked by two pieces of darker, harder oak. Eliott recollected similar rudder construction at other foreshore sites, leading him to consider that this variation of wood type might be a deliberate technical choice, designed to make the most of the timbers’ natural properties, so that the rudder is strong and hard-wearing but also flexible, and therefore able to withstand collisions. Judging by the numerous nail holes, and many surviving nails in the timber, it also looked as if it had been sheathed in metal, possibly copper, but this covering would have been stripped and recycled as part of the ship-breaking process. The rudder didn’t appear integral to any structural feature on the foreshore. 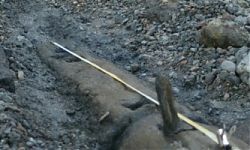 Once cleaned and examined, the timbers seemed to represent stages of revetment and consolidation, possibly linked to the chalk rubble just east of the timbers, which has been previously recorded by TDP. The positioning of the horizontal beams so that they were level (rather than sloping towards the river) suggests that they were arranged to form a bargebed. Another structure (below) further east turned out to be a more technically complex construction, a linear feature extending from the south river wall towards the river. 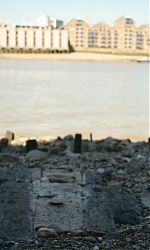 However, the purpose of this was not clear, perhaps it formed some kind of causeway or slipway. An exciting and unexpected addition to the usual assemblage of timbers, looked at first like a spongy kind of plank; a long (approx 1m), spatula shape emerging from the Thames mud. It was broken, and eroded so that a ‘honeycomb’ interior was visible. It was incised with cutmarks, and places where it appeared to be sawn. On closer inspection, this ‘plank’ turned out to be a bone, a very big bone, which by our reckoning could only belong to one thing (after ruling out dinosaur): a whale. Another, large bone lay nearby, just to the east of the first; a single vertebra. 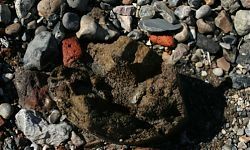 These discoveries tie into the Rotherhithe docks’ historic associations with whaling expeditions (from which the Greenland Dock took it’s name), and processing of whale carcasses, but the bones’ presence on the foreshore is somewhat mystifying. 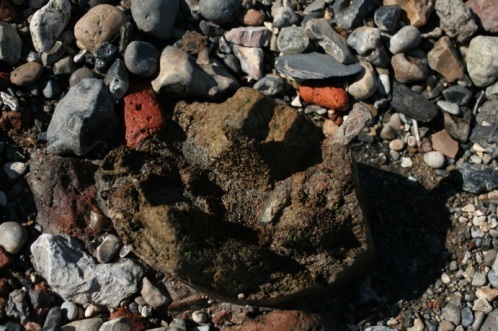 The evidence of disarticualtion and processing distinguishes these mammal remains from the famous right whale skeleton excavated in Greenwich in 2010. 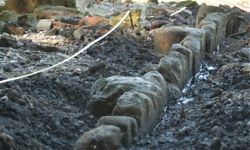 The larger bone appeared to be placed in alignment with the other revetment timbers, leading us to wonder – could this bone have been reused as part of the bargebed structure? 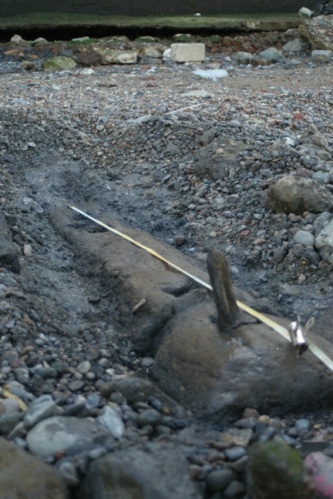 A third enormous bone (see image below) appeared to confirm this hypothesis conclusively; it had a large iron nail hammered into it, though no associated timbers have been preserved. 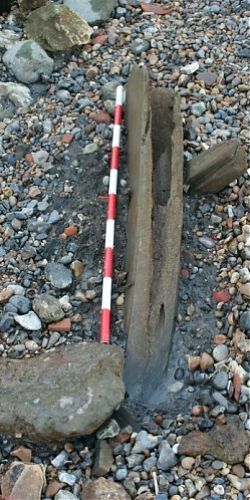 The archaeological recording of these intriguing features provides evidence about the ways that people lived and worked on the foreshore and the river, and the nature of the dock’s structures at Rotherhithe. It also highlights the importance of the work of the TDP and FROG volunteers who are recording and interpreting this unique material before it is claimed by the river.